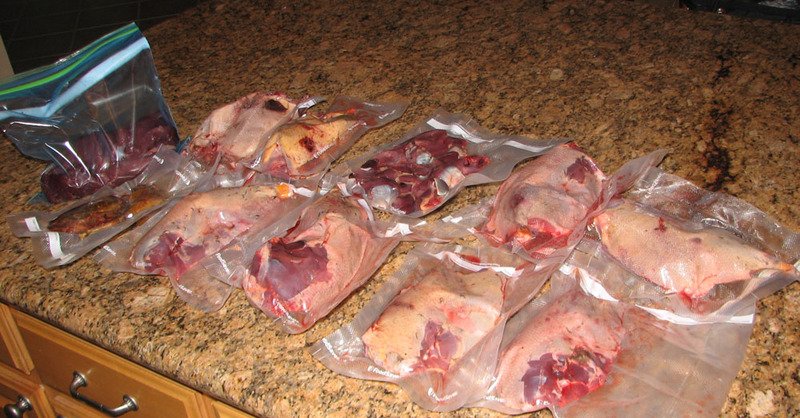 Here’s a good way to make goose jerky, or any kind of jerky for that matter. I’ve always used a combinatgion of soy sauce and Worcestershire sauce as the basis of my jerky. With just these two ingredients, you can produce good tasting jerky by marinating your jerky meat in a 50/50 mixture. The flavor is good, but after a while it gets a little boring. So, here’s a way to make things more interesting by adding some variables that you can experiment with. 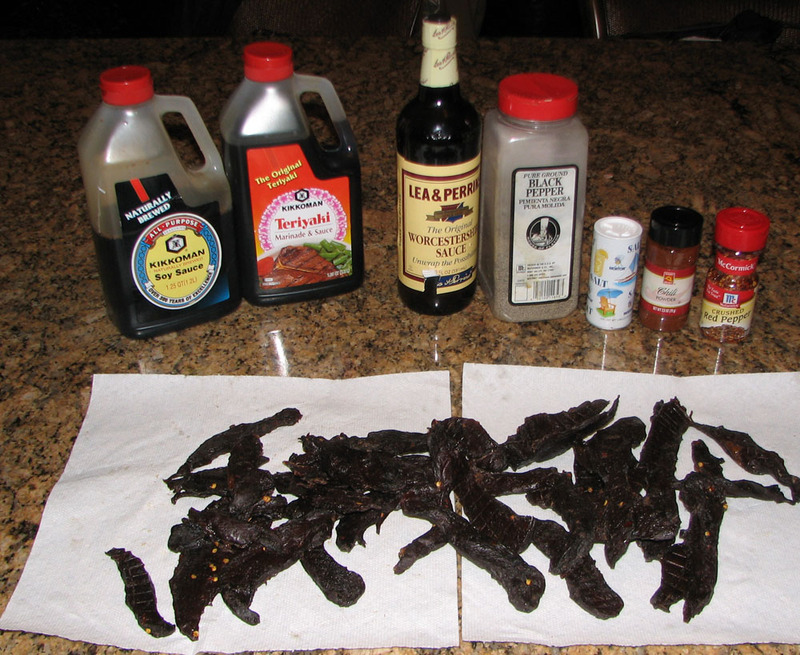 Here are some ingredients to use to make jerky spicy and/or sweet. Teriyaki can be used instead of Worcestershire sause or in combination with it. This will sweeten the flavor. Chili powder and red peper flakes can be used to make the jerky spicy hot. Don’t overdo it. A cup of brown sugar and water will also sweeten the pot. Ducks unlimited magazine published a variation of this recipie in their Sept/Oct issue and my friend Jeff suggested the addition of teriyaki sauce. He also said he preferred to make his with little or no chili powder. Brown sugar is a good addition. 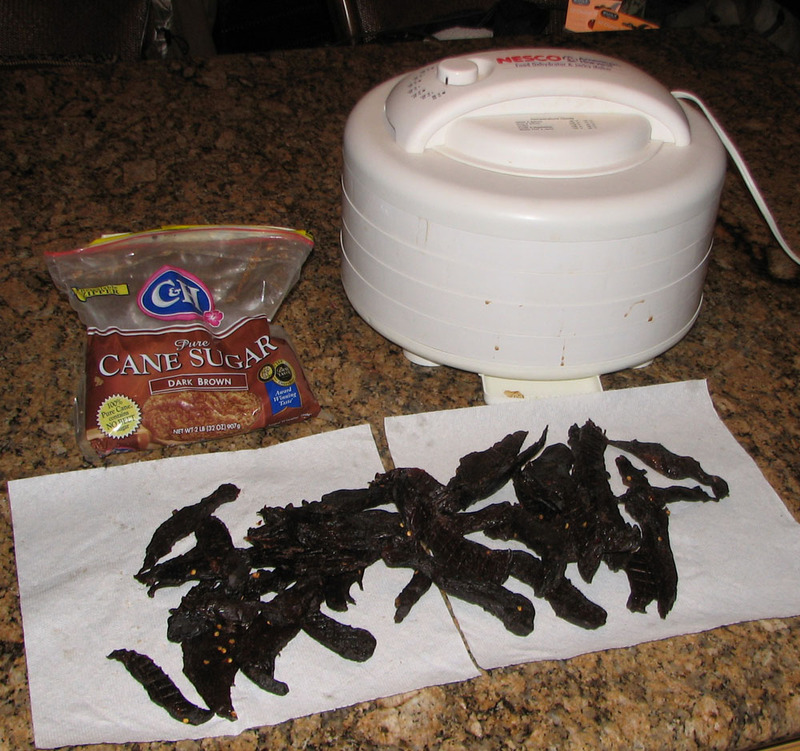 I generally use a dehydrator to dry my jerky (Jeff used an electic smoker for his, smoked it for an hour at 165 degrees and finished by air drying). The temperature on the dehydrator can be set as high as 165 degrees, but don’t leave it that hot for more than an hour. Today I left the temp set at 120 degrees for about nine hours and then 165 for an hour to finish. It’s a good idea to make it hot for an hour to eliminate any chance of bacteria growth. I’ve never worried about this before and many times I’ve just air-dried jerky to completion, but it doesn’t hurt to be safe. Here’s the recipe I used for this batch. 1 cup soy sauce, 1 cup water, 1/4 cup Worcestershire, 1/2 cup teriyaki, 1 cup brown sugar, 3 table spoons of salt, 2 tablespoons of chili powder, 2 tablespoons of red pepper flakes, 3 tablespoons of course ground pepper. I brined the meat for about 20 hours and dried it for ten. The flavor is very good, but it’s slightly hot. Good with beer, but probably hotter than you’d like if you’re going to eat it in the woods. To take on a hike, I’d leave out the hot stuff. Other than that it would be just fine. This waterfowl season will be remembered as a underachiever. Hunting has been below par. As usual, there has been some feast, but also much famine. Pre-season waterfowl population reports were encouraging and the hunting started off with a bang on opening day. That’s one hunt you can count on. However, November and December were very poor. During the last week couple weeks of December, I ran a string of Mayberry hunts together where I didn’t fire a shot. The birds just were not there. Hunting at Webb Tract has been better and fairly consistant. Mayberry has had fewer ducks this year than any year I can remember since the habitat matured in the mid 90’s. I haven’t shot a limit of ducks at Mayberry since the opener and that’s rare, but it’s the days without a shot that have been tough. On Saturday, Joe and I set up twice and hunted until mid day before we fired a shot. We did manage to bag four ducks before we left. I made a mistake and shot a hen mallard. Joe got the drake. He then knocked down a gadwall and I closed out with a drake sprig, but it was a long day. The ponds are deep and difficult to navigate. I made the mistake of chasing after the hen mallard without my wading stick and paid the price when I tripped over a cattail and went for a swim. Furtunately the water didn’t quite make it down my waders. There were large flocks of birds around, but they were in their late-season pattern of very cautious behavior. But, that’s duck hunting. I guess that’s why duck hunters are notorious for sounding negative. 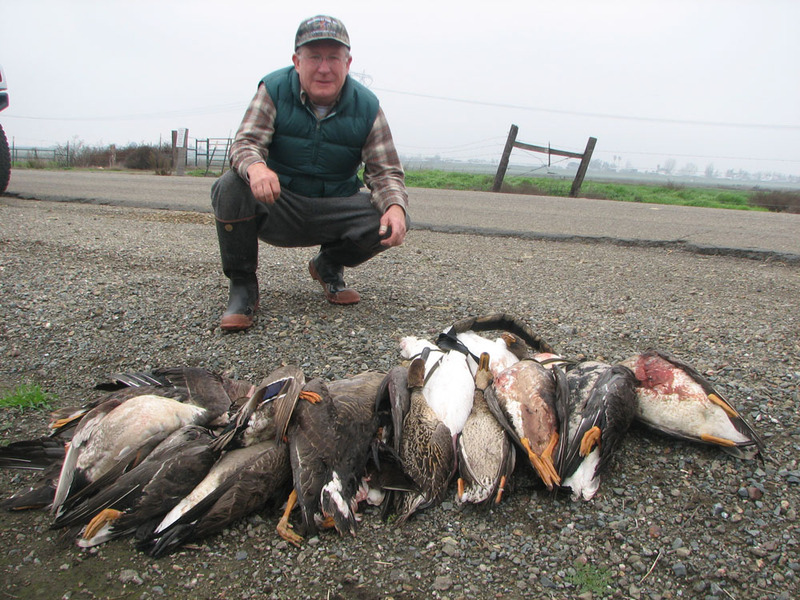 The dynamics of waterfowl behavior and all the variables that come into play often leave the duck hunter sounding dazed, frustrated and even ungrateful. The resulting hunting report is often based more upon the hunter’s personality and perception than what’s really happening in the marsh. The current flood conditions will once again test duck hunters, hungry for a final flurry – a flurry that will satisfy few and frustrate most. My advise – don’t set your expectations too high for the last weekend. Enjoy good company and take what is given. Don’t hunt till dark on the last day and leave some time to reflect on your blessings. If you do this, you won’t go wrong. It’s all set. Here’s the scoop on the 2010 MDF banquet for the Livermore-Pleasanton Chapter. Banquet date: 3-11-2010. Door open 5:30 PM. Price: $80 single, $125 couple, $45 life member & youth. Includes MDF Cap. Master of Ceremonies: Rick Bullock. Drink ticket plan – give away drink tickets with raffle packs and sponsor tables. Guns: 250 people with a ratio of one gun per every 7 people. Better guns will be in the progressive raffle. Ticket Chair: Bob Holm (925)447-2044. Tickets by fax to Rich Fletcher (925)373-6602. Early bird by 2-28-2010: raffle for five $100 raffle packs and double progressive raffle tickets and a drink ticket for each banquet ticket purchased. Raffle packs: $100 – 2 guns and a drink ticket, $300 – 2 guns and three drink tickets, $500- 2 guns and five drink tickets. Best guns in the more expensive ticket packs. $500 packs limited to 30 total. Committee members: Daren Solero, Rick Bullock, Tom Homen, Jerry Jennaro, Rich Fletcher, Bob Holm, Brian Holm, Terry Ludlow, Gary Pacheco, Rich Fregulia, Jack Revazza, Dave Nosenzo and Rick Bullock. MDF Regional Director: Randy Morrison. If you read my previous post, you know what a mess of geese looks like. Here it is again. This is a pile of waterfowl. This is a pretty intimidating pile of dead birds. I have to admit to being a bit overwhelmed as Fred and I began the process of plucking. We got the birds into a reasonable state and I also dropped one spec off at a friend’s house on the way home. It was plucked, but not gutted. The wings, legs and head were also still attached. My friend’s wife came to the door in her bathrobe as he wasn’t home. I placed the carcass on their kitchen counter and departed, hoping that he would know what to do when he got home. My worst fear was that she would drop it in the garbage before he even arrived. Anyway one less bit of goose work for me. On Sunday afternoon while watching football, I began the process of cleaning up the pile. That’s when I videoed the project. The video is on youtube. Click on the link to see it now. That will give you my thoughts on how to proceed. 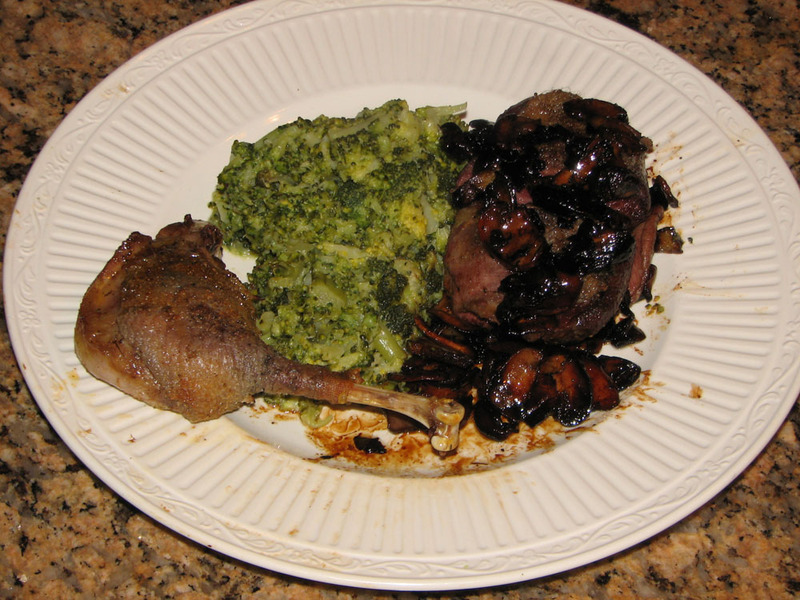 I worked on each bird, resulting in a processed result of goose meat to be used in several ways. 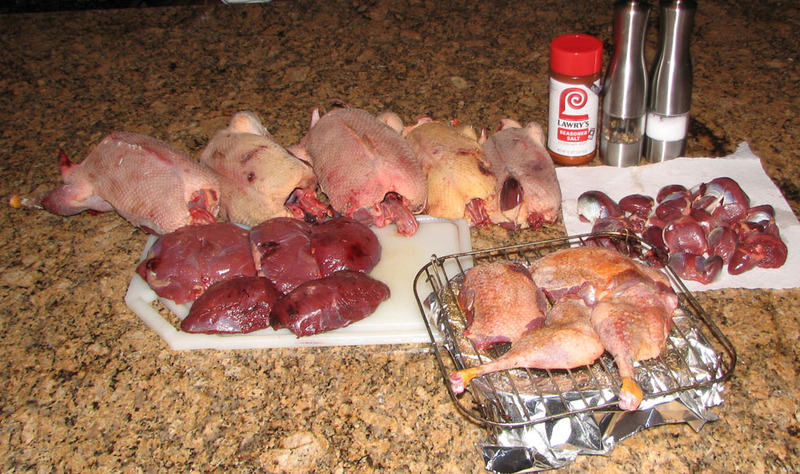 The best eating birds, the specs, mallard and pintail were completely cleaned and plucked for roasting – one spec for dinner Sunday night and the rest for freezing, except I ended up delivering one spec to my neighbors across the street who enjoy eating ducks. Here are the results. Some for roasting, some for frying and some for jerky. The Aleutian, snow goose and damaged spec will be sliced thinly, brined for a day and then dried in my dehydrator for jerky. The roasting birds will be shrink wrapped except for the one on the rack which is ready to be roasted at 400 degrees for 15 minutes. I recommend that you pull it out of the oven and check it by slicing open to see if it’s right for you after 12 minutes. The specs were split to make individually sized individual portions. The gizzards will be fried up. And, the package to the upper left is the leftovers from dinner. Here is the dinner. I’m convinced it was every bit as good as filet mignon. Do not over cook. Medium rare is ideal for me. 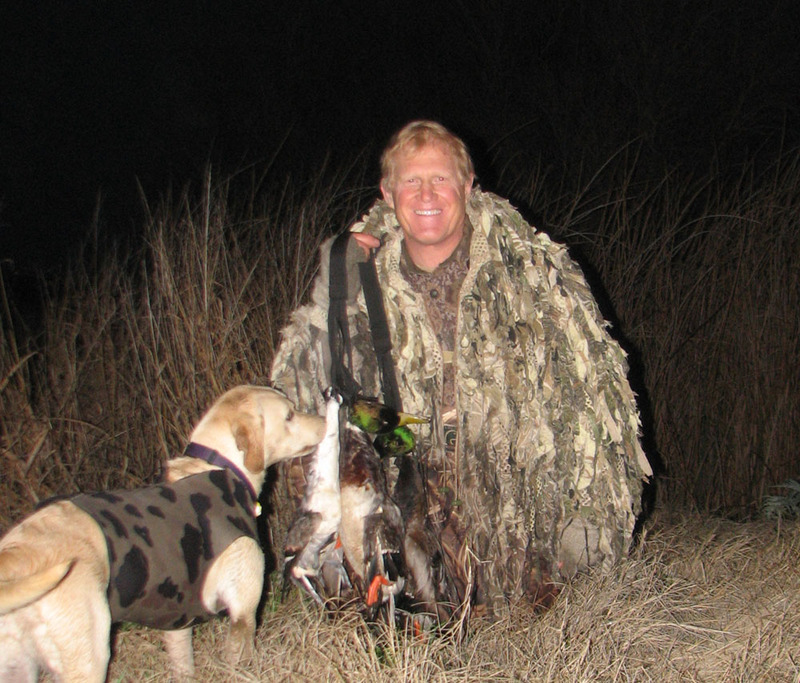 Last Friday, Fred and I went to Webb Tract for an overnight goose hunt. The hunting on Friday was slow as the birds we’re moving and the fog wasn’t quite right. By the end of the day we had four geese and two ducks. Our attitude was waining and with doubt about the Saturday weather, we were not optimistic about our chances. To our surprise, the dawn arrived with a perfect fog, just off the ground, but apparently thick enough to force the birds to fly underneath it. We walked to the south end of our property and immediately began to get action, mostly from white-fronts, but occasionally snows and Aleutians. Ducks were also in the mix, just about every variety you could think of. As the morning wore on, the hunting seemed to get better, peaking about 9:00 AM. The shots were long, but do-able. My first three geese came down on third shots. Typically that means I was not leading them enough with my first shot. As the birds flare, they slow and rise, making them more vulnerable to followup shots. With three specs and an Aleutian, I was pretty satisfied and starting to think about picking up when Fred sailed a bird about 150 yards across a nasty pond. As Fred was hunting about 150 yards from me, we were conversing with our walkie talkies. I agreed to take one side of the pond while he took the other. He almost immediately shot a snow goose. Lola took off swimming the pond after the goose. A while later she came back with it – she retieved it from Fred’s pile of geese. A flock of specs flew over me and I downed one. Sometimes retrieving is productive. Still heading after Fred’s goose, Lola and I trudged though the mud along the edge of the pond. Fred and I completely circled the pond from both sides – no goose. We let Lola search, but nothing came up. Fred suggested he take Lola out into the field to see if it had traveled. I agreed. About that time, three pintail came flying by and we dropped two of them. Once again, retrieving was productive. Not pretty, but effective. Fred and Lola headed out into the field and Lola jumped the goose which she dispated with a growl. Now I had four specs, an Aleutain and a pintail. I told Fred I was ready to head in. All this walking in thick Delta bog was making me tired. As I returned to my gear, I heard Fred shoot and down came two ducks, landing in front of me in the middle of a fairly large pond. Fred called on the radio an asked if I’d seen his bird come down. I asked if it was a duck and Fred said yes. I sent Lola after it. I put her at heal and repeated the words, “Mark, Mark..” Her ears perked up and I sent her. Not being a perfectionist, she ran around the edge of the pond until she was close to the bird and then went in after it, but the mallard hen was lively and she couldn’t catch it. I decided to help out and followed Lola around the pond. Half way to the chase, a large flock of snow geese appeared before me in the fog, I kneeled and waited. As they passed overhead, I picked out a bird and missed with the first shot and hit it with the second. My third shot hit it again as it sailed down about 150 yards away in the direction I’d come from. It looked like it died before reaching the ground, but a rise blocked my view of where it came down. Now I had more work to do. Wading the pond, I finished off the mallard, ending the chase. Lola brought it to me and we took off after the goose. After a lengthy search, she found it. Now I was really ready to head in. The load was so great that I walked back to camp and returned with the ATV as we had well over 50 pounds of ducks and geese in the bag. After we left the island, we found a place to pluck the birds. Fred posed for a photo. Here’s what a goose mess looks like. On the way to our duck club, we passed a pond covered with geese. They stood staring at the vehicle from about 100 yards. I used my camera to take a brief video which can be watched on youtube by clicking the link below. It’s impressive to see how many geese were stacked in the pond. What’s a beautiful duck hunt? No duck hunt is perfect. Often we attempt to reach perfection, but duck hunting is too dynamic to ever be perfect. Somewhere along the line, something goes wrong to diminish the effort slightly. When that happens the hunt is no longer perfect, but it is still beautiful. And, that’s the way it was on Saturday January 9th. As I lifted the pintail whistle to my mouth and twirled my tong to make the sound of a drake sprig, three birds came in over the top of me from behind and passed over the decoys whistling – two drakes and a hen. They flew past the decoys, made a u-turn and passed back over the decoys, arriving on my left at about 30 yards. Boom, I hit a drake, boom he dropped. Lola jumped from her stand and made the retrieve. Well, she made most of the retrieve. I walked the last few yards and picked up the bird. Three minutes into the hunt and we had our first bird, However, perfection had already eluded us and thus the hunt could now only be beautiful. The action slowed after the shooting and it was a while before more birds began to work. There were a few teal and wigeon, but we wanted mallards and sprig so we waited. A marsh wren hunted in the cattail a few feet from me. It alway impresses me that they are so unafraid of humans. Geese were calling in the fog above us – mostly white fronts, but there were also a few snows and Aleutians. Occasionally I called on my spec call, but only one came in and Tom later informed me that the bird had slipped by me in range. As I sat waiting, a black weasil like critter ran across a downed patch of cattail about thirty yards away. It was the first mink I’ve ever seen, but it wasn’t in sight very long. Eventually a flock of mallards circled to my call and passed directly overhead. I knocked down a drake. Things were looking up. I carry a turkey seat with leg extensions so Lola can stay out of the water. It is light to carry and stable. I played with my camera and attempted to video the marsh wren, but it wouldn’t hold still. Although we didn’t take a lot of shots, working birds held our attention and the morning flew by. A mallard drake passed by and I called, but he didn’t turn. A couple minutes later he came back and flew right past Tom who dropped him with one shot. 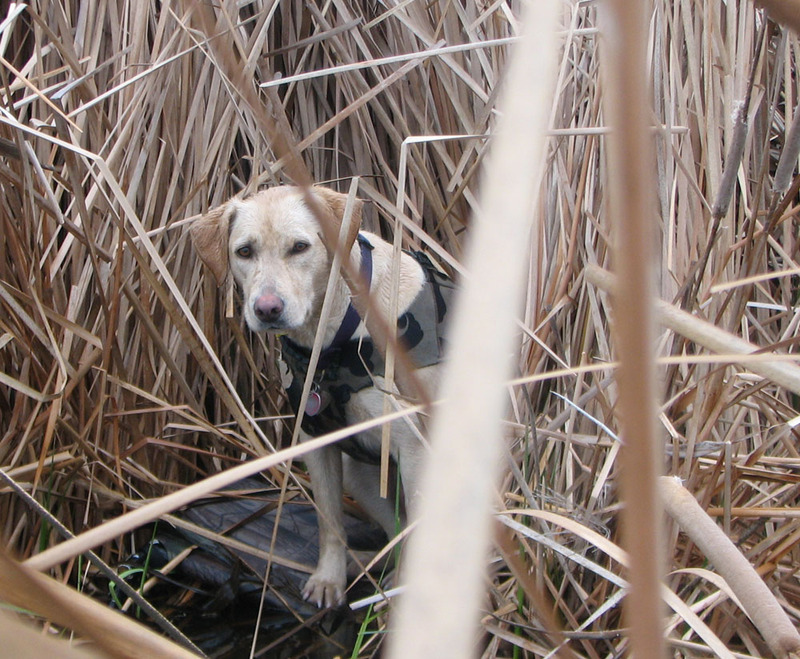 Lola made a fine retrieve and now we had three nice birds with most of the day still ahead of us. After retreating to the trailer for some soup, we returned to our decoys and more action. Teal, wigeon and spoonies were the first to work the pond, but we held out. About three in the afternoon, mallards and sprig began to drop down. Who knows where they came from or why, but they had arrived. And, they came to the call. After I dropped a drake mallard that buried himself in a thick cattail patch, Lola dug him out. She didn’t retrieve him, but did point him out to me. After she snorted into the cattail, I walked over and peered into the crevice she had made with her head. Sure enough there he was. The closest to perfection we came all day was on the next series of ducks. First a pair of pintail came in towards the decoys from behind Tom – heading east. As they passed over the decoys, I called on my mallard call and the banked away from me to the north while setting their wings and dropping down. It looked as if they were about to come up short and land to the north of the decoys so I made a soft mallard call they the held up off the water long enough to attempt to land in from of Tom. That’s when Tom dropped the drake. Lola made the retrieve. Within minutes, a flock of mallards passed by and I hailed them with the mallard call – they banked and passed behind me. I chuckled on the mallard call as they passed behind me and disappeared behind the cattail on my left. The next thing I knew they reappeared at about 40 yards in front of me and landed between me and Tom. I stood up and they jumped from the water heading directly over Tom who dropped the drake. Birds continued to appear overhead and a flock of mallards circled around us to the north and turned back heading directly towards me. They were low and they were humming. I took a drake with a head-on shot (always thrilling) and swung to another drake but missed. It’s a lot more difficult to make doubles when you’re shooting only drakes. It was the first duck we shot at without killing it all day. It was also the last. To finish the hunt off, a couple hundred greenwing teal came in off the nearby fields and worked the pond over our decoys. Sometimes the two groups of birds would come in from opposite directions at full speed and nearly collide with each other. The sound of the air rushing over their wings and the speed with which they passed at only a few yards was thrilling. We picked up about 4:30 and made it back to camp with a little light left. We hadn’t seen or heard another hunter all day. Tom is wearing his guille suit. These suits are effective camofauge in the cattails. With a four-hour drive ahead of him, Tom posed for a photo before he left. It was a beautiful hunt.